Taleizadeh, A., Halat, K. (2017). Inventory Control Games with Prepayments. 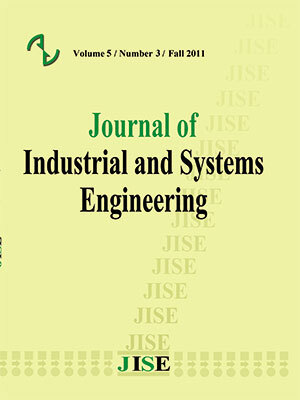 Journal of Industrial and Systems Engineering, 11(Special issue on game theory applications' in industrial engineering), 127-143. Ata Allah Taleizadeh; Kourosh Halat. "Inventory Control Games with Prepayments". Journal of Industrial and Systems Engineering, 11, Special issue on game theory applications' in industrial engineering, 2017, 127-143. Taleizadeh, A., Halat, K. (2017). 'Inventory Control Games with Prepayments', Journal of Industrial and Systems Engineering, 11(Special issue on game theory applications' in industrial engineering), pp. 127-143. Taleizadeh, A., Halat, K. Inventory Control Games with Prepayments. Journal of Industrial and Systems Engineering, 2017; 11(Special issue on game theory applications' in industrial engineering): 127-143. The cost game arises when a group of retailers who observe demand for a common good decide to cooperate and make join orders following the EOQ policy. In this paper we present a new class of inventory games that is strategically equivalent to that class of inventory cost games: inventory games with advance payments. This model extends the traditional inventory model to the situation where advance payments of retailers are required. We propose a core distribution, which is based on a proportional allocation, as well as a population monotonic allocation scheme, for inventory games with advance payments. Then, we examine the stability of grand coalition from both a myopic and farsighted perspective, and conclude that it is always stable from both points of view. To complete our study, we develop a sensitivity analysis for the model and evaluate the changes produced on the proposed core distribution. Anily S., Haviv M. (2007). The cost allocation problem for the first order interaction joint replenishment model. Oper Res 55, 292–302. Beullens, P., Janssens, G. K. (2014). Adapting inventory models for handling various payment structures using net present value equivalence analysis. International Journal of Production Economics, 157, 190-200. Bondareva, O.N. (1963). Some applications of linear programming methods to the theory of cooperative games. Problemy Kybernetiki, 10, 119-139. Chen L., Gürhan Kök A., Jordan D. Tong. (2012). The Effect of Payment Schemes on Inventory Decisions: The Role of Mental Accounting. Management Science, 59(2), 436 – 451. Chen, X., Zhang, J. (2016). Duality Approaches to Economic Lot‐Sizing Games. Production and Operations Management, 25(7), 1203-1215. Chwe, M. (1994). Farsighted coalitional stability. Journal of Economic Theory, 63, 259–325. Dror M. and Hartman, B.C. (2007) Shipment consolidation: who pays for it and how much? Manag Sci 53, 78–87. Dror, M. and Hartman B.C. (2011). Survey of cooperative inventory games and extensions. J. Oper. Res. Soc. 62, 565–580. Fiestras-Janeiro M.G., I. García-Jurado, Meca A., Mosquera M.A. (2011). Cooperative game theory and inventory management. European Journal of Operational Research 210, 459-466. Fiestras G., García-Jurado I., Meca A. and Mosquera M. (2012). Cost allocation in inventory transportation systems. TOP 20, 397-410. Fiestras G., García-Jurado I., Meca A. and Mosquera M. (2013). A new cost allocation rule for inventory transportation systems. Operations Research Letters 41, 449-453. Fiestras G., García-Jurado I., Meca A. and Mosquera M. (2014). Centralized inventory in a farming community. Journal of Business Economics 84 (7), 983-997. Fiestras G., García-Jurado I., Meca A. and Mosquera M. (2015). Cooperation on capacitated inventory situations with fixed holding costs. European Journal of Operational Research 241 (3), 719-726. Gupta R.K., Bhunia A.K., Goyal S.K. (2009). An application of Genetic Algorithm in solving an inventory model with advance payment and interval valued inventory costs. Mathematical and Computer Modelling 49, 893-905. Hezarkhani, B., Slikker, M. and Van Woensel, T., (2018). Collaborative replenishment in the presence of intermediaries. European Journal of Operational Research, 266(1), 135-146. Jouida, S. B., Krichen, S., Klibi, W. (2017). Coalition-formation problem for sourcing contract design in supply networks. European Journal of Operational Research, 257(2), 539-558. Kohli R., Park H. (1989). A Cooperative Game Theory Model of Quantity Discounts. Management Science 35, 693-707. Krichena S., Laabidia A., Fouad Ben Abdelazizb. (2011). Single supplier multiple cooperative retailers inventory model with quantity discount and permissible delay in payments. Computers & Industrial Engineering 60, 164-172. Lai, M., Xue, W., Zhao, L. (2016). Cost allocation for cooperative inventory consolidation problems. Operations Research Letters, 44(6), 761-765. Maiti A.K., Maiti M.K., Maiti M. (2009). Inventory model with stochastic lead-time and price dependent demand incorporating advance payment. Applied Mathematical Modelling 33, 2433-2443. Mateuta S., Zanchettin P. (2013). Credit sales and advance payments: Substitutes or complements. Economics Letters 118, 173-176. Meca, A., García-Jurado I., Borm P. (2003). Cooperation and competition in inventory games. Mathematical Methods of Operations Research 57(3), 481-493. Meca, A., Guardiola, L., Toledo, A., 2007. p-additive games: A class of totally balanced games arising from inventory situations with temporary discounts. TOP 15, 322–340. Meca A., Judith Timmer, Ignacio Garcia-Jurado, Peter Borm. (2004). Inventory games. European Journal of Operational Research 156, 127–139. Meca, A., Timmer, J. (2008). Supply chain collaboration. In: Kordic, V. (Ed. ), Supply Chain, Theory and Applications. I-Tech Education and Publishing, Vienna, Austria, pp. 1–18. Nagarajan M., Sošić G. (2008). Game-theoretic analysis of cooperation among supply chain agents: Review and extensions. European Journal of Operational Research 187(3), 719–745. Schulz, F., Schlereth, C., Mazar, N., Skiera, B. (2015). Advance payment systems: Paying too much today and being satisfied tomorrow. International journal of research in marketing, 32(3), 238-250. Shapley, L.S. (1967). On balanced sets and cores, Naval Res. Logistics Quart. 14, 453-460. Shapley, L.S. (1971). Cores of convex games. International Journal of Game Theory 1, 11-26. Sprumont, Y. (1990). Population monotonic allocation schemes for cooperative games with transferable utility. Games and Economic Behavior 2, 378–394. Taleizadeh A. A. (2014). An economic order quantity model for deteriorating item in a purchasing system with multiple prepayments. Applied Mathematical Modelling 38, 5357–5366. Taleizadeh, A. A. (2017). Lot‐sizing model with advance payment pricing and disruption in supply under planned partial backordering. International Transactions in Operational Research, 24(4), 783-800. Taleizadeh A. A., Pentico, D.W., Jabalameli, M.S., Aryanezhad, M.B., (2013). An economic order quantity model with multiple partial prepayments and partial backordering. Mathematical and Computer Modelling 57, 311-323. Teng, J. T., Cárdenas-Barrón, L. E., Chang, H. J., Wu, J., Hu, Y. (2016). Inventory lot-size policies for deteriorating items with expiration dates and advance payments. Applied Mathematical Modelling, 40(19-20), 8605-8616. Timmer J., Chessa M., Boucheriea R. J. (2013). Cooperation and game-theoretic cost allocation in stochastic inventory models with continuous review. European Journal of Operational Research 231(3), 567-576. Toledo A. (2002). Problemas de inventario con descuento desde la perspectiva de la teoría de juegos. Ph.D. thesis, Universidad Miguel Hernández de Elche, Spain. Zhang Q., Yu-Chung Tsao, Tsung-Hui Chen. (2014). Economic order quantity under advance payment. Applied Mathematical Modelling 38(24), 5910–5921. Zhang, Q., Zhang, D., Tsao, Y. C., Luo, J. (2016). Optimal ordering policy in a two-stage supply chain with advance payment for stable supply capacity. International Journal of Production Economics, 177, 34-43.